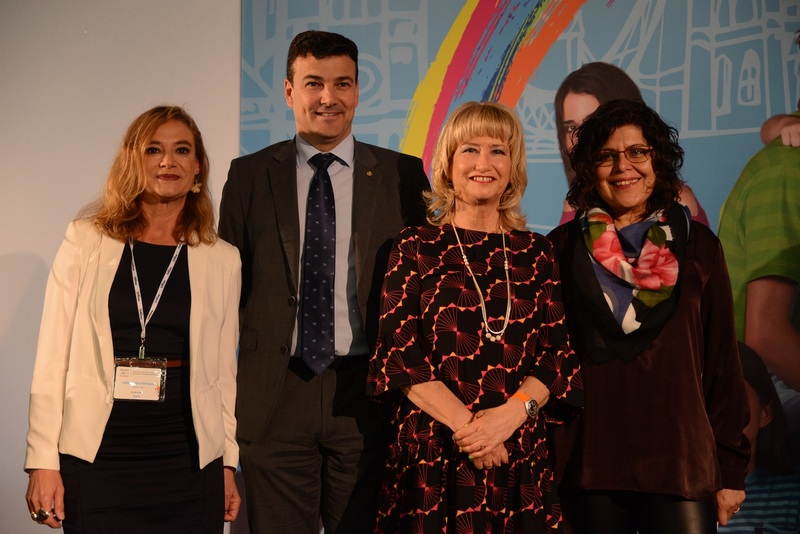 The Councillor for the Department of Economic Development and SMEs and Employment from Marbella Town Hall Cristóbal Garre, today opened the annual Helen Doron Franchise Conference in the Hotel Barcelo in Marbella. He was joined by Ángela Sánchez Master Franchisor for Andalucía, Extremadura and Murcia, Helen Doron CEO and Founder of Helen Educational Group, and Meena Athwani Master Franchisor for Catalonia and Ebro. Garre welcomed the 200 Master Franchisors from 34 countries to Marbella and thanked them for choosing the city. He emphasized the need for more learning opportunities in Spain for the two key languages – English and computer programming to “train the entrepreneurs of the future”. Helen Doron thanked the Marbella Town Hall for its support and warm welcome. This is the second time that Spain has hosted the Helen Doron Annual Conference, which is held each year in a different country. They have chosen Marbella for this year’s conference, due to Helen Doron’s love for Andalucia and its standing as an international hub where a high level of English is essential, not to mention the unbeatable climate and gastronomy. Until the 5th of April, 200 Master Franchisees from 34 countries are staying in Marbella to discuss new developments in this unique English learning method. The annual conference offers a full programme of business presentations and workshops, break-out sessions and fun activities, as well as sharing ideas and successes to further empower the international network. Helen Doron Educational Group was recently awarded with Best Children’s & Education category in the Global Franchise Awards 2019, and a large team from corporate headquarters, together with franchisees from all over the world, will be celebrating the honour throughout the four-day event. As stated by the Master Franchiser of Andalusia, Extremadura and Murcia, Angela Sanchez, Helen Doron Educational Group updates their educational programs and materials every year, adding value to their unique methodology, which is based on two basic pillars. Firstly, the child is in an English-speaking environment where repetition and listening are essential. The second pillar is to reward children when they learn. In this way, children from 3 months of age learn English as if it were their mother tongue, without difficulty, pressure or effort. Parents are advised to stimulate their baby from an early age with songs and English in the background while they relax and enjoy time together. The first months and years of a baby’s life are the best time to learn a second language according to the Helen Doron Educational Group’s pedagogical team. Learning two languages at the same time from a young age improves the development of mathematical skills such as problem solving and spatial reasoning and has been shown to help prevent diseases such as Alzheimer’s, among many other benefits. This significant conference gathers passionate business people, as well as their spouses, from around the world, generating hotel bookings and attendees enjoying the area’s restaurants and tourist attractions. The international franchise prides itself on offering “More than English. Values for Life”. The network not only has proven success in teaching nearly 3 million students in 37 countries, but the brand stands for values such as tolerance, contributing to the community, protecting the environment and respecting cultural differences which are major themes throughout the programmes. Founded in 1985 to teach children English as a Foreign Language, the Helen Doron Educational Group has more than 1,000 learning centres and kindergartens in 37 countries. Helen Doron’s innovative and proven methodology is the creative inspiration behind the company’s flagship franchise, Helen Doron English, together with Helen Doron Kindergartens, MathRiders, and Ready Steady Move! To date, the Group has taught nearly three million children to speak English, master maths, experience nature, and learn through movement. The network is rapidly expanding, while maintaining its core values and community spirit, combined with business success.